and BitPost, and I just came across BitNation's Basic Income concept. Hi Aaron. Totally. I introduce several new concepts. This pattern is really the most interesting one. I've watched it, but I'm not (yet) sure what to make of it. Ok, I´ll try to walk you through how I look at it. There are a couple of meta-concepts that I need to introduce. The image below is the capitalist network that runs the world. Each of these nodes will only be able to be part of Basicincome.co if they partner with other nodes that are part of it. 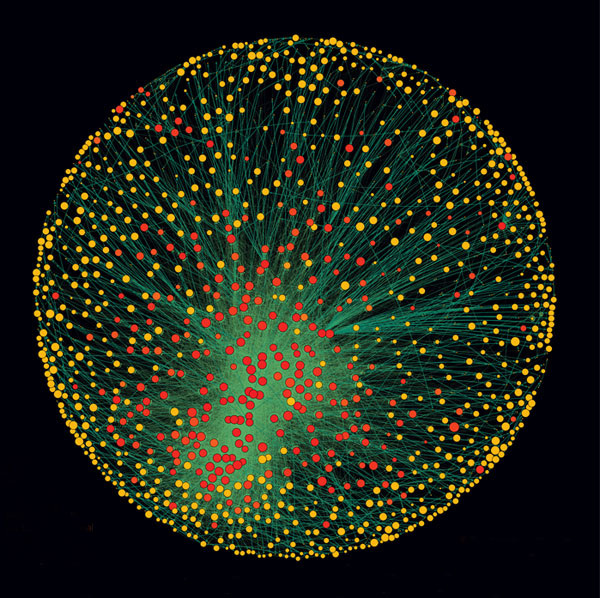 If a couple of these nodes feel like a basic income-based society is something they´d want to invest in - analogous to how major corporations invest money in charities - they´d be able to offer their services, and basic income, to potential costumers. If that offer was available to me today, I´d totally consume from those corporations. In other words, the corporations that choose to join will get a selective advantage. These patterns are all pretty much unexplored, I´m a pioneer. I think the reason this technology doesn´t exist yet is because the technologies I bootstrap on are less then a year old. "tax" redistributed to and how? So, the incentive layer is really the most interesting pattern in my system. Most of the articles that have surfaced online have pretty much missed it, and it´s great to talk to you about it. The taxation is no different from other taxation, they automatically pay x% in tax. The % is regulated by the network, democratically. The dividend is automatically shared across the network, in the same way http://bitshares.org and http://ucoin.io does it. I´ve invented a concept that I call Decentralized taxRate Governance that I´ll implement in future versions, but it bootstraps on the incentive layer, and I can´t really communicate it until people get hooked on the feedback loop idea. Like Eames says in Inception, you need the simplest version of the idea in order for it to grow naturally in the subject's mind. It's a very subtle art. The dividend is automatically shared across the network, in the same wayhttp://bitshares.org and http://ucoin.io does it. I´ve also invented a concept that innovates on that, but, again, no idea is simple when you need to plant it in somebody elses mind. This concept, that I call swarm-redistribution, looks at trophic webs of consumption and production, and treats all consumption as investments, and consumers as shareholders. I try to communicate that idea in this article my portalresilience.me. So, the first version is really meant to seed the incentive layer-idea out into the world. I cannot by myself manufacture wonderment in others, but I can create the precursors for inspiration, and my work is really about showing people that innovation is possible, whilst, of course, creating the worlds first and best commercial grade p2p-basic income ecosystem, to show them that it´s not only possible, but it could be done by one single person using a 2011 MacBook. The tools are already in the cloud. On the technical side, I bootstrap on the Ripple API subscribe function. That way, I´m not limited to one single gateway like, say, rippledividend.com is. Like any other dividend-system, my system knows whenever there´s been a transaction. It then makes the accounts themselves pay the tax directly to the swarm, in the same way that BitShares does it. I´m really in love with the Ripple-concept, and I´ll be evolving the symbiosis between ripple-protocols and p2p-dividend protocols during the following years. I´ve already uploaded concepts that demonstrate all of these technologies, and there´s going to be a lot of improvements as more people join the conversation. So, the most interesting concept is The incentive Layer. That´s an entire revolution in itself. The next concept is peer-to-peer pathways. Like @weboftrustnet wrote to me on Twitter, my system is built on the same peer-to-peer logic as Ripple. Each node becomes the center of it´s own swarm. This is interesting for the same reasons that Ripple is interesting. It expands the sphere of possibilities. This ties in with my swarm-redistribution algorithm and the idea that everyone becomes a shareholder of every investment they make, ever. Every single transaction you ever make and have ever made is treated as an investment, and creates what I call a dividend pathway, and you receive dividends through these pathways. In other words, if you create a pathway of $100, you´ll receive $100s in shares, and then that pathway closes. Your safety net emerges from your financial interactions. All these parameters can be experimented with, and since my software is open source, and modular, it´s really easy for anyone to do so. why would anyone shop at this supermarket in the first place? (and other stores) involved at all? The short answer is that they get more money out of it. Flat tax is always progressive, the nodes at the bottom of the trophic chain are always going to receive a surplus, and the nodes at the top will always pay a surplus. Again, corporate networks that want to create a basic income society gain a real market-advantage once my network is online. If you are the CEO of some venture, and want to contribute to a basic income network, then you´d gain a huge advantage as you´d attract consumers. If a consumer can choose between a store that supports their basic income, and a store that doesn´t, they´ll choose the store that gives them basic income. No, you will miss out on it, but only temporarily. The design I have right now is that nodes get disconnected if they consume outside the network, and stay disconnected until they´ve missed out on shares equal to the amount they consumed for. In other words, if they consume for $100 from a store outside the network, they miss out on $100 in dividends, and they might loose costumers while they´re disconnected, as their costumers might prefer not to become disconnected. If you´ve consumed for 200 XYZ outside the network, you´ll be disconnected and 200 XYZ of dividends will just pass right through you, and then you´re online again. All the exact dynamics of it are plastic, people can tinker around with them. In the designs I use right now, each node is treated equally, I don´t treat "corporate nodes" or "consumer nodes" differently. Each node is treated as both a producer and a consumer. But all this is really plastic, and it´s just like 2 minutes of work to create a fork that uses other incentive layer dynamics. The coolest part of it is the pattern I introduce. I'll just keep asking questions until I have a picture of what this system looks like, ok? 1) How is your network going to check whether or not I'm consuming outside of the network? (How are penalties imposed?) I could just walk to my cornershop and buy cheap stuff with cash without anyone ever knowing, right? 2) If I have to consume at a store in the network in order to get basic income, but that store is more expensive than other stores because it's part of this network, wouldn't it then be better for me to simply go to the cheaper store and safe money instead of going to the expensive store in order to basically get my own money back through basic income? 3) Why would rich people ever join this network? They don't really need basic income, they probably want cheap products, and if they wanted to give money to the poor they could do that even without this network, no? In other words: it seems like the only people who have an economic incentive to join this network are people who would gain more in basic income then they would need to spend extra at this stores in the network. But for these people to gain, some other people would need to lose. They would need to spend more additional money then they would get back in basic income. Why would these people join this network? 1) The feedback loop pattern exists on another level. I´ll walk you through some of it and just keep asking. The currencies that are in circulation within the network - held in accounts that are connected - can´t leave the network without anyone knowing, the transactions are on a public ledger. If you, me, and millions of others join the network, it would build up a huge amount of wealth, an economy, and that money can´t be taken out without you, me, and everyone else knowing. I´ll start with that, just keep asking about this. 2) Well, the whole notion of basic income is that the rich loose money and the poor gain money. This is not really something unique to my system, it´s the foundation of the basic income philosophy. So, if you´re not super rich, you´ll definitely gain money from paying the extra tax. 3) Well, that´s assuming rich people are going to exist in the future, and we all know that artificial intelligence is going to make us all unemployable. But, like, ignoring that, rich people are rich because they provide a popular service, and that service is just like any other venture. So, if you were that CEO, and you wanted to join some other CEOs to create a basic income society, you´d join, and if you didn´t want to, you´d keep enjoying your working class underlings, which won´t be of much use anyway as you´ve got technology that makes for better employees. So, it´s really just the incentive layer over again. And, it´s not like successful ventures loose by investing in a basic income society. Everyone knows the Swedish model rocked the world, and this is just evolution. It´s just government, but crowdsourced, direct democracy embedded in feedback loops between producers and consumers, in real time. It´s the same thing, but smarter. An upgrade. Look at the dividend pathway concept. Each transaction you make creates, or adds to, a pathway. Dividends flow down these pathways, from top to bottom in a fractal tree-like pattern. This scales beautifully. Aaron ! I should also emphasize that a corporation that joins the network will attract costumers. The corporations that join get a market advantage. That's one of the core concepts of the incentive layer, it creates a sort of positive selective advantage. Like, think darwinian, every new technology changes our behavior, and so too with this one. To explain why corporations would take part in basicincome.co, and how it then would serve as a powerful and democratic tool for wealth redistribution, I must first explain why consumers would prefer corporations that are connected. To do this I will start by going over a few basic concepts. In Basicincome.co, you have an individual “basicincome pool”. The size of your pool is determined by the size of the your basicincome swarm and its level of redistribution. 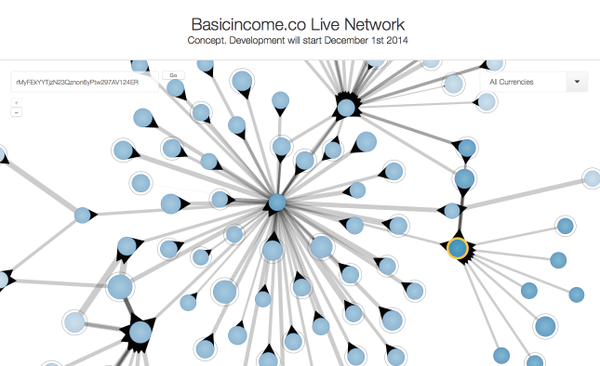 Your basicincome swarm consists of all the nodes that you are connected to through your basicincome transactions (transactions made through basicincome.co). You do not only connect to the individual node with which you make a transaction, but also with this node’s basicincome swarm. Therefore, if you trade with a corporation that has decided to use basicincome transactions with its entire supply line, your swarm will grow significantly. The level of redistribution is determined by the tax level set by: a) yourself; and b) the nodes within your swarm. You can never receive basicincome at a higher level than the one set for your own transactions. If you trade with a node that has a lower tax level than you, your distribution level will be capped to that node’s level until the amount of the transaction has passed through you. Therefore, if you trade with someone who is outside the network, or who has a tax level of zero, you will stop receiving basicincome for a short while. This means that consumers who want to receive basicincome will benefit greatly from seeking out corporations that are connected to basicincome.co. Therefore, corporations are incited to join the network in their effort to gain and keep costumers. Not only will this mean that consumers can create a resilient financial safety net through making active consumerist choices. The corporations will also be encouraged to take greater financial responsibility for their entire supply line. No, and it´s actually not tied to currencies at all. My software can be used as an opt-in service by users from any financial platform. The only thing that´s required by the platform is that it has an open ledger, and some API functions, and both Ripple and BitCoin have that, and it´s pretty much standard in next-gen financial platforms. RIght now, it works for every currency on the Ripple Network, and I could easily extend it to the BitCoin Network or the Ethereum Network. Again, on the technical side, the Ripple API has a subscribe function, and the BitCoin API too, and this makes it super-easy to make something happen as a transaction happens. So, it works for every currency on the Ripple Network, and could easily be extended to any other network as long as it has the same basic API features as Ripple and BitCoin. Again, as for currencies, any transaction that could be connected to Basicincome.co works, so all currencies on API-powered next-gen platforms (Ripple, BitCoin) work. my system works through creating a mirror-network, each dividend pathway is rendered in Basicincome.co´s own network, which means that it doesn´t matter what currency is feed into my network as long as it can be feed in. and the Basicincome.co API makes it really easy to connect a new financial platform, like NXT or Ethereum, to my #DApp. Excuse me my radio silence from time to time. I'm in the middle of a couple of things, but I haven't forgotten about you or your project. I will admit, however, that I still have trouble grasping how it works. In essence, I guess I don't see how buying stuff at a more expensive store could ever benefit individual participants of the network. Is it so that you can't take money (whether it be euro's of bitcoins or whatever) out of the system without anyone knowing (and "fining" you for doing so)? yes ! you can´t take money out of the system. if you do so, the system penalizes you. it´s a positive-feedback-loop only system. all not-super-rich individuals that participate can only gain money. super-rich individuals that participate do so to crowd-fund a basic income culture, or to get an advantage in the fight over customers. "I can't wait to hear...sounds like a fascinating idea...I can imagine how it might work - crowdsourcing (or swarming) bits of funding from all over the world.."
I´m really inspired by a quote from @jasonsilva where he says: "you cannot manufacture wonder, but what you can do is to pull people so radically out of context that they´re forced to gawk at the ubiquitous everyday wonders that they´re culturarilly conditioned to ignore", and I think that I´ve sort of achieved that, I´ve raised the stage. Like when I started 2 years ago, people couldn´t even imagine a basic income, but now everyone´s talking about it, and the next problem for people was to imagine how you could make sure that people only had one account, but i mean, we´ve always had identification systems that worked and it´s not a real problem, and the next thing people couldn´t imagine was.... there´s a whole list of biases, and with every new piece of content that I push to the cloud, I create a ripple-effect. that´s what I´ve put online. The algorithm to solve everything. What I call "the reislience network". And a working software implementation of it. I´ve worked 1500 hours in the past 5 months, and to be honest I´m quite tired now. Like I told Susanne @ bitnation, i´m not a corporate person, i´m not a technologist, i´m an artist, and I won´t let matter of fact statements ruin the poetry of life. I love what I´ve achieved so far, and this is just the beginning. My work IS the basic income revolution. That is what I work for. And I know that doesn´t appeal to business people, but I´m not a business person. I don´t run a business, I lead a revolution. This is much much bigger then what most narratives make is sound like. In essence, I guess I don't see how buying stuff at a more expensive store could ever benefit individual participants of the network. "You do not only connect to the individual node with which you make a transaction, but also with this node’s basicincome swarm. Therefore, if you trade with a corporation that has decided to use basicincome transactions with its entire supply line, your swarm will grow significantly." What my idea is all about is to apply the idea of shareholders at the level of transactions. It's that simple. That is what my technology does. And it interfaces every next-gen finance platform. The reason I relate my idea to basic income is because I have a background as a medical student, and I work with this for humanitarian reasons. But all my technology does is extend the idea of shareholders. "first things first" basis at the moment.